Qeema Paratha is a stuffed rectangular pocket paratha made with minced cauliflower and fresh green peas .This is a vegetarian version of the popular minced meat parathas. For the alphabet ‘Q’ I knew I had to make a Qeema Paratha as Q doesn’t offer much options in terms of Indian recipes . Normally when we say Qeema one thinks of minced meat , but for vegetarians Soyabean takes over . Since I am not a soya person I decided to use minced cauliflower . So we have a Gobhi ka Qeema which has been stuffed into these whole wheat flour pockets for the alphabet ‘Q’ under the theme Flatbreads and More. I saw a couple of videos on Qeema parathas and followed their method . A chapati is rolled , then stuffing is placed in the center . Beaten egg is added to the stuffing and then the sides are folded to form a rectangle . While making the vegetarian option , I made the chapati , placed the minced Gobhi qeema , folded the sides and made the rectangular paratha. This rectangular paratha is put on griddle to roast . Once it is half done I poured some chickpea batter on top instead of using egg with the stuffing . I wanted to give it a authentic Lucknowi touch and this innovative touch gave the paratha a new dimension and it tasted awesome . One doesn’t need any accompaniment with these parathas , they are wholesome , but of course papads make very good accompaniment with any paratha , including these Qeeme ke Parathe . Heat a pan and add oil to it . Add onions and ginger garlic paste . Add cubes potatoes , grated cauliflower . Add salt and turmeric and mix well . Sauté till the cauliflower has slightly wilted . Simmer the flame and cover the pan with a rimmed lid . Pour water over the lid and let cook till cauliflower and potatoes are done . Once the potatoes are cooked add the boiled peas , tomatoes and green chillies . Once again cover and cook , till the tomatoes are soft . Add red chilly powder , garam masala and kasoori methi and now sauté on full flame till the veggie has no moisture . You can enjoy the keema with rotis or rice and even use it as a stuffing . Let the stuffing come to room temperature . Mash the stuffing a little . Do not over mash it . Mix all ingredients under the batter and gradually add water to get a smooth Dosa like consistency . Take a dough ball and roll it . Place the stuffing in the centre and first fold from left , then right . Seal from the sides using a little water . We shall get a rectangular paratha . Place the paratha on a moderately heated griddle . Roast one side and flip over . While the other side is being roasted , add a ladleful of the besan batter over the paratha . Wait for a minute or two for the batter to change the colour . Flip the paratha and drizzle oil . Cook both sides till nice and crisp . 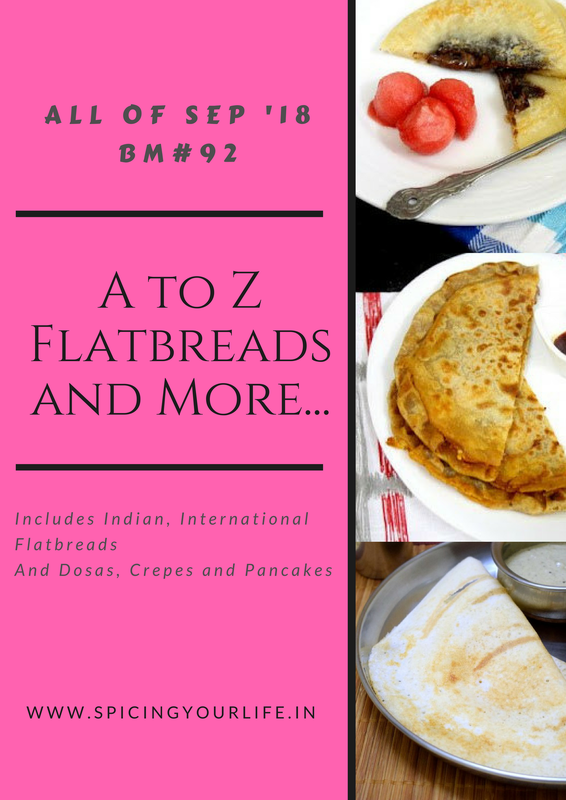 Here are some recipes with the alphabet ‘Q’. Such a tempting looking plate Vaishali! Simply irresistible!! Love the idea of cauliflower kheema ….a must try surely!! Give me that plate, and love the way you have shaped this parathe, kids will definitely love this kheema paratha pockets, yes this is how i wish to call this incredible parathas. Qeema ke parathe rocks.. I love the idea of the chickpea flour coating . Very filling I am sure. OMG! These parathas are too good Vaishali. I think of paneer in place of minced meat always. Using cauliflower is a wonderful idea. And that egg sub batter is so good. yum these qeema pocket full of cauliflowers are my kind of dish. Just grab them bite and do whatever you you want. Love these ones. I will make this small size for sure. Actually I kept thinking about kheema paratha just for the meat stuffing. Thanks to this BM that I made my kheema paratha with soya filling. Awesome Vaishali! this is one stunning dish. Though you made with cauliflower, I am sure it was, even more, tastier than soya. I don’t like soya too and made hubby eat it. Wish I had this idea too. And cooking with a besan layer on top is out of the world. It must have given the roti a pakoda taste and I simply love it! A chila covered paratha which is stuffed with minced veggies….wow what an innovative recipe Vaishali. Must have tasted so great. Wow what an interesting twist for the use of egg. Simply awesome. Loved the paratha and specially it’s shape. Delicious. soya is full source of protein… great choice for q… love the flavorful stuffing. These queema paratha would be such a great recipe for the lunch boxes. I love the cauliflower based vegetable filling and my boys would be crazy for this. That’s a superb paratha Vaishali!For me vegetarian version of kheema is soy granules. I am not a huge fan of it but my daughter loves it! And using cauliflower to make kheema is such a brilliant idea! Love that egg substitute batter as well. So innovative! Delicious pics!